The Lord Mayor of Bradford, Councillor Dale Smith, hit the jackpot at a recent charity event, hosted by contracting, shopfitting and manufacturing company PEC. Earlier this year, PEC organised the Heart Appeal charity ball, held at Aagrah Midpoint, to raise funds for equipment for the Cardiac Unit at Bradford Teaching Hospitals NHS Trust. At the event, PEC chairman Balbir Panesar, invited the Lord Mayor to pick the winning prize draw ticket and, in front of 350 guests, the Lord Mayor picked out his own ticket! He promptly volunteered to put the prize of a widescreen TV back into the draw. 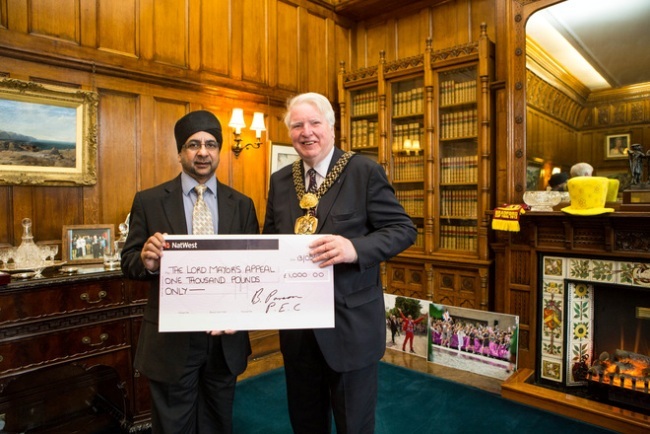 Balbir Panesar, chairman of Bradford contracting, shopfitting and manufacturing company PEC, presents the Lord Mayor of Bradford, Councillor Dale Smith with £1,000 raised at a charity event earlier this year.